This entry was posted in mobile learning, mobile technologies, mobile web. Bookmark the permalink. For institutions, having the app in a place they have immediate and unrestricted access to gives them greater control over maintenance and updating, etc. Their “web server” may well sit in the cloud on Amazon for example…doesn’t necessarily mean it’s sitting in a room on campus. 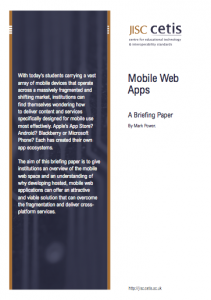 The point is that – again, for educational institutions – having a web-based, hosted app rather than a native app with the app store/marketplace conditions enforced as they are, can be an advantage. Not sure if your comment is supposed to be a snipe or not, erm…”Norbert”..
No, you’re right, not everybody is. But the audience for this briefing paper IS educational institutions. Therefore the benefits of ease of development, control and – above all – deployment are the purposes of the overview. I in no way believe that Web Apps should be THE WAY and that Native Apps are not. But I believe that there has to be a viable solution to the fragmentation problem for certain sectors and markets. And I believe that the web is that solution. Maybe not a perfect one. But a viable and improving one. Hi Mark, an interesting and timely paper for us – our mobile learning systems implementation isn’t a web app per se, but certainly closer to this than other (moodle community) offerings to date. Thanks, Rhodri. I’ll have a look.